God intends for this compelling vision of His people singing to include you. He wants you, he wants us, to sing. Or maybe you don’t sing at church or if you do, not with very much enthusiasm, hoping to hide behind a wall of sound. After all, not everyone sings at the same skill level, same rhythm, or pitch. 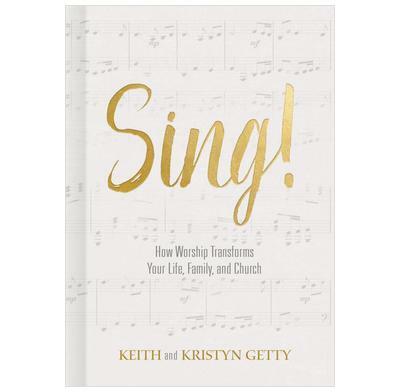 Authors, lyricists, and worship leaders, Keith and Kristyn Getty write to church members to remind them why the Church should sing, when the Church should sing, and how the Church should sing. A congregation that gains a greater understanding of why they sing won’t dread a worship service, with arms crossed and shoulders slumped, but see singing as an opportunity to proclaim the gospel together in obedience to God. Sing! guides individual church members together with their congregation on a campaign to declare with one voice, This is why we sing! With a rare combination of theological insight, the lessons shaped by years of practical experience, and remarkable readability, this book is simultaneously evocative, informative, and accessible. As someone who seeks to communicate the Word of God I’m so aware that songs have great power to teach. They reach into the heart and mobilize the will in such a profound way, and I’m therefore deeply grateful for the faithfulness to Scripture that characterizes Keith and Kristyn’s hymns. Songs bring us to the truth or cause us to sway from the truth and, therefore, we must celebrate those whose musical gifts are so wonderfully under the authority of Scripture. Keith and Kristyn have served the church for years through their songs. Now they’ve gone one step further and served us with their book, Sing! It’s a treasure trove of biblical, practical, and gospel counsel for those who love to sing, want to sing, or don’t think they can sing.